Their meat is heavily marbled and renowned for its tenderness and flavor. Their total numbers was nearly 60,000 head in 1940. But their total numbers declined rapidly in the years after the Second World War, when mechanization of agriculture and more extensive cultivation of cereal crops in the region. There were only 700 cows left by 1970, and efforts for recovering and conserving the breed began. Their total number increased gradually and there were about 3,400 cows in more than 140 farms in 2013. A herdbook for the breed was established on 31 July 1896. Currently the breed is available in many countries and has been exported to Chile, Spain, Australia and the United Kingdom. They are medium to large and usually uni-colored grey, with some variations due to age and gender. Both bulls and cows usually have horns, and their horns are incurved and often down turned. The horns are waxy yellow at the base and usually black at the tips. The average height of the Bazadaise cows is around 140 cm, and around 145 cm for the bulls. 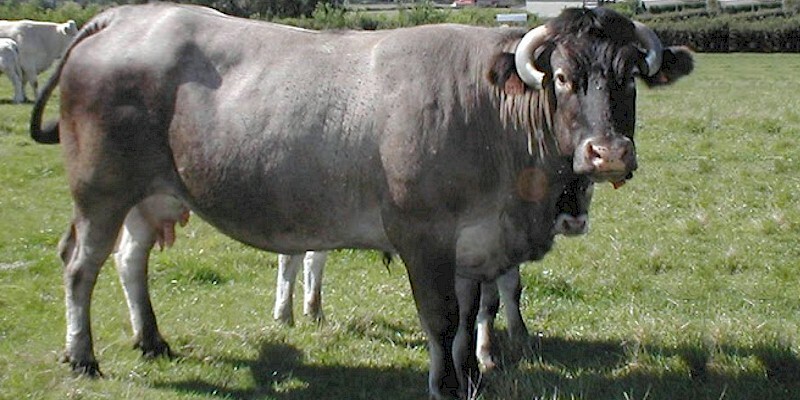 The mature bulls on average weight around 1000 kg.